In the final battle of the Round of the Saintly Sixteen, Emma of Hawaii takes on Paul of Tarsus. The winner heads to the Elate Eight to square off against Thomas Cranmer. Two primary questions will be decided in the next 24 hours: 1) Will the Bishop of Hawaii once again be able to get out the vote for Queen Emma like a pointy-hatted precinct captain? 2) Will Romans 8 swing the tide toward Paul despite all those run-on sentences that are the bane of lectors throughout all of Christendom? This past weekend we saw how have the legions (and by that word we mean lots of people not the uber-demon in Mark 5:9) of Lent Madness fans coped with another bout of LMW (Lent Madness Withdrawal): they read about Lent Madness in Sports Illustrated and watched fans on video answer the question “What do you love about Lent Madness?” The Supreme Executive Committee does what it can to ease your pain. Following the climactic match-up of this round (made up of saintly Quirks & Quotes), only eight saints will remain standing. We’ll kick things off on Tuesday morning with Mary Magdalene taking on Evelyn Underhill. Then we’ll proceed with Dietrich Bonhoeffer vs. Jerome followed by Margaret of Scotland vs. Enmegahbowh and Thomas Cranmer vs. the winner of today’s match-up. The “madness” never ends! Well at least for a bit longer. Check out the updated bracket and prepare yourselves mentally and physically for the crescendo of the saintly smackdown. When Emma of Hawaii was born in Honolulu in 1836, the young chiefess was offered for adoption to her mother’s sister, Grace Kamaikui Rooke, and her husband, an English court physician. This followed the Hawaiian custom of hanai, whereby a child would be given to grandparents to raise or to a couple who, like the Rookes, were unable to have children. In old Hawaii there was no such thing as an unwanted child. Children were told they were “bowls of light put here to shine great spirit greatness.” In the Rooke household, Emma was taught to be very British while her hanai mother, Grace, raised her to be Hawaiian as well. 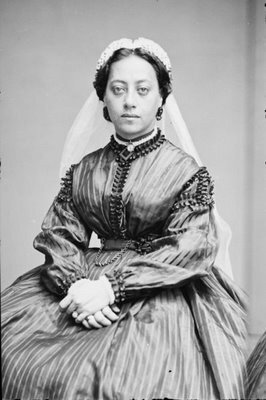 Shortly after her marriage to Alexander Liholiho, King Kamehameha IV, in 1856, the new queen became involved in life of the kingdom. Her deepest concern was saving the Hawaiian people from extinction. In fewer than 80 years, the Hawaiian population plummeted from 350,000 to 70,000 due to disease introduced by Europeans. The threat of extinction was a very real. In his first speech as monarch, Kamehameha proposed the building of a hospital and the young couple quickly worked to solicit funds to establish one. To honor her dedication to the effort, the hospital, named Queen’s Hospital, opened in 1859. It is said that Emma visited patients at the hospital every day that she was in Honolulu, a practice that gained her the great love of her people. In addition to their concern for the physical well-being of the Hawaiian people, Queen Emma and the king took steps to ensure their spiritual well-being, with the first services in the new Anglican church formed by the Church of England at their behest held on October 12, 1862. The king and queen were baptized on October 21 and confirmed in November. They felt the Anglican church was “eminently suited to the character and temperament of his people,” according to the website of St. Andrew’s Cathedral. However, the couple’s happiness at the establishment of the Church of Hawaii was clearly diminished by the tragic death of their four-year old son just six weeks prior the Pro-Cathedral’s consecration. More tragedy followed when King Kamehameha died 15 months later at age 29. Known more for his missionary travels and fierce dedication to the mission of Christ, it may come as a surprise that Paul of Tarsus (5-67) is arguably the best-selling author of all time. Sure Plato, Shakespeare, and even J.K. Rowling have their fans, but this devout Jew, thrown from his horse then given a vision of Jesus so real that he dedicated his life to talking about it, did so with such appeal that even today, the Bible remains the world’s best selling book. Paul is responsible for about two-thirds of the New Testament. His greatest hits are more memorable than Agatha Christie’s and more numerous than The Rolling Stones’. They include the Book of Romans, especially chapter 8, “[nothing]… will be able to separate us from the love of God in Christ Jesus our Lord,” 1 Corinthians 13, “Love is patient, love is kind…” and Ephesians, Philippians, and Colossians, “And whatever you do, in word or deed, do everything in the name of the Lord Jesus…” (Col. 3). Paul’s quirks are generally known and roundly contested. They include his partiality to the single life and his ‘thorn in the flesh’ (an eye infection or a burdensome companion). 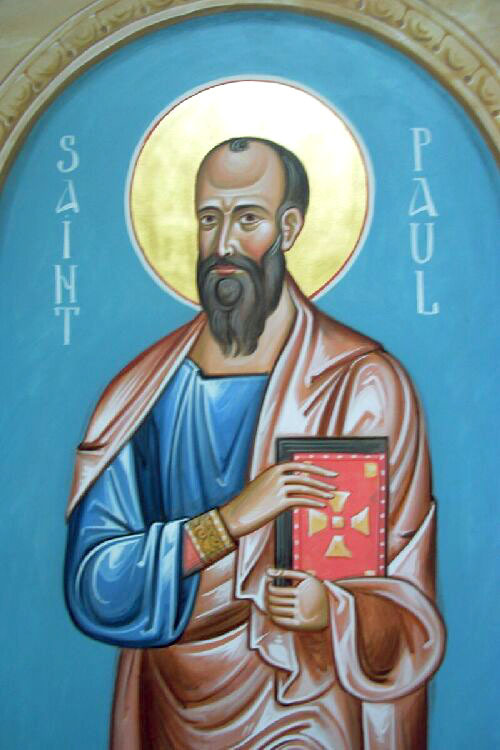 Paul condoned slavery, treated women as second-class citizens, and was prone to rather heated arguments. Yet his compulsion to document his Christian journey and theological convictions would overshadow his most distracting paroxysm. While much of his writing was done in less than perfect conditions (jail), under less than perfect deadline pressure (death), and with less than perfect remuneration (persecution), his deep-seated conviction, that life in Christ was an all or nothing affair, pierced every text: “For me living is Christ and dying is gain.” (Phil 1). Paul’s motivation was passion. His reward was martyrdom. His legacy, to every writer everywhere, is to write with conviction. Paul empowers authors to believe that their greatest work is to channel that which is deep within them, to affect a world far beyond them, through a presence mostly unknown to them. Here’s to a guy who did all sorts of amazing stuff, still found time to write about it, and never made a nickel. 101 Comments to "Emma of Hawaii vs. Paul of Tarsus"
EMMA, EMMA, EMMA, EMMMA ! I really take exception to the statement that Paul treated women as second-class citizens. I will not deny that there are passages in the authentic Pauline corpus that certainly do not make him a proto-feminist. At the same time, Roman culture was deeply patriarchal and Paul was conditioned in that context. Yet, yet, we see throughout his ministry that he identified many women as his partners in ministry — Lydia, Priscilla, Junia and so many others. The culture he was in treated women like second-class citizens. Paul, like many of us, struggled between being implicit in the worst aspects of his culture and by the grace of God had moments where he could transcend that. Point is well taken – thanks for clarifying this! I love Paul’s writing. I respect him and love him as a brother in Christ (well, maybe great uncle). He is a hero, and makes Christ’s work come alive for me. However, he is way too cranky (justifiably, but still). Emma’s gentle, strong spirit and life of dedication get my vote today (and without lobbying by the Bishop of Hawaii, too). Oy — Well, much as I find Emma’s witness compelling, I’m going with the putative author of my life verse — Galatians 2:19b-20 — and this one, too — “I want to know Christ and the power of his resurrection…” (Philippians 3:10-11). Thank you. Paul, for giving me the words for my heart’s desire and my life’s Source. As my daughter says, “Paul rocks”! My vote is for Emma of Hawaii. I particularly like the way in which she encorporates the Truth of Christ into both her indigenous culture and the Victorian culture imposed on her people. She lived out Christ’s command to “Feed my Sheep” in ways which were a benefit for both cultures. Paul is a great guy, but I should have loved to know Emma! I think Queen Emma lived out the life of Christian community that Paul so strongly advocated. I’ll vote for her, and I suspect Paul would, too! I may be living back on the east coast, but my heart still resides in Hawaii. Queen Emma deserves our vote. Paul lives on in his writings. I proclaim Emma’s selfless devotion as servant to her people. I heartily recommend (although I’m casting my vote for Emma) a read of Marcus Borg and Dominic Crossan’s “The First Paul,” for a good look at the writings of Paul that are conclusively Pauline, and not written in his name later. I found it a helpful vision of Paul that is neither patriarchal nor comfortable with Roman culture of the time. Well, I must start over as everything I previously wrote got lost in the netherworld of overwriting…I am wont to do that. On Emma ! Break the tie, all ye of Hawaiian birth and your kith and kin. Whip them in line, O ye mighty Bishop of that diocese ! I cannot bear to see Paul ascend to the Final Four in spite of his having contributed more to the Bible than any other writer. Just can’t overcome my aversion to his misogynism and part in the onholy act of violence against Stephen…and the thorn in his flesh? An eye infection? HA !!! On Emma !!!!! Don’t forget the invitation to come to Nashville and help me educate all these folk as to my maniacal love of LENT MADNESS…they think I made it up ! Oh, all of them of little faith ! Luke contributed more than Paul! GO EMMA! GO EMMA! GO EMMA! That last photo of Emma with the darling little hat, was so endearing. We need that photo to be posted again! Emma gave her life for the Hawai’ians to see the light of Christ. Emma, Emma, Emma deserves the Golden Halo. A hard choice today but after reading that Paul treated women as second class citizens, that made the choice much easier..EMMA, EMMA, EMMA. Paul has gotten a lot of bad press because of what others seem to have written in his name. He was not the misogynist of popular myth. That said, I’m voting for Emma. I just like Emma. Thank you, Dan, for pointing out Paul’s respect for and partnership with many women. Really, this should not even be a contrst except for people’s seeming fascination with underdogs and surprise upsets. We smply cannot overstate Paul’s contribution to Christianity. He made us what we are today. Thank you for all you did, Emma, but Paul of Tarsus must win this bracket today. Whoopsie day! I forgot to send the SEC a new photo of Emma. Have two awesome choices on my laptop and will send when I’m not sitting in the optometrist’s. Progressive lens rock! Indeed, without them, you might not know which lovely photo of Emma to send us fans! As an artist and writer, I’ve got to say, I would vote for progressive lenses in a heartbeat–I never leave home (or my bedroom) without them! Thank you, Heidi! Lovely Queen Emma gets my vote, forever! Emma is awesome so has my vote despite my daughter Katie Rose’s grudge against for her knocking out Rose of Lima (we did grievously with our patrons this year as she lost out first round with both Catherine and Rose, and her brother lost out with Nicholas!) Echoing what a few others have said about Paul–he was far from perfect in his approach to women, or slaves, but the worst statements attributed to him about women in the NT were later ones written by others in his name. And his support of women as well as that in even those later pastoral epistles has been hidden by mistranslation and bad theology and preaching which hid his endorsement of Junia as an apostle, Phoebe as a deacon, Prisca/Priscilla as the generally first named leader in a team ministry marriage, and women deacons misnamed as deacons’ wives in 1 (or was it 2) Timothy? Paul! Paul! Paul! (just as an echo to earlier voters’ shout-outs for Emma) Why? “Do not be conformed to this world, but be transformed by the renewing of your minds, so that you may discern what is the will of God — what is good and acceptable and perfect.” Never mind all the other good stuff he wrote, the life he led, the example he set, the passion, the daring, etc., etc. Emma was my Mom’s name. Tips the scales for me. Even though I love Paul for who he was, today I am voting for Emma of Hawaii because of her compassionate heart. I am a heart person and new at this game. It’s all about Paul. His impact is most profound judging by the bible and the lives he changed during his time. Emma! Emma! Emma! If Paul wins, I’m putting Emma on the church’s bracket at the winner. I simply will not give this one to Paul. NO way. No how. Part of what helped Emma become Emma was Paul’s writing. It’s another tough choice today, but with a curtsey to the lovely and admirable Emma, I stand with team Paul. A little off-topic, but while I have heard numerous sermons about Paul being knocked of his horse, I have yet to find a translation that mentions anything about riding on any animal; simply that he was knocked to the ground. Have I missed one? I don’t consider him a misogynist, either. In paintings he is often depicted as having fallen off a horse, most notably in the striking work by Caravaggio. But I don’t believe there is any biblical truth to that; it just seems to be a way to let people know that the figure is Paul. What is a chiefess? Sounds like a Paulism describing Emma. Although his writings are profound for the witness of Christ in his life, I can’t forgive Paul for all of those run-on sentences. Also, Emma’s day is my birthday, so I am still going with Emma. Thank you, Heidi, for teaching me so much about Emma. But the Scriptures must trump all. Thus I promised before my ordinations. If Paul loses, I will understand why the Virginia delegates at Convention prevented the addition of any black letter days to the 1928 Prayer Book. As a former lector who was forced repeatedly to tackle Paul’s horrendous Romans passage in which he managed to use the word ‘circumcision’ about 156 times, I confess to a long-simmering loathing of Paul and his legalese. Give me ANYONE else, thank you! I love Paul dearly (I think he had way more respect for women than his time and culture would have allowed for), but Emma gets my vote in this match-up. To have suffered so much and to have shown such grace is a true mark of sainthood. She deserves the Golden Halo. Paul, no question. Emma seems lovely, but there are few individuals who have had as extraordinary an influence on the course of Christian history as Paul has. I greatly enjoy reading Paul’s letters (and their reference to church issues that are far too prevalent even today). One musn’t forget that he wrote for specific churches at a specific point in time to address specific issues. Just because others have used Paul’s letters to justify misogyny doesn’t mean that he was misogynistic himself. That being said, while tomorrow I might be inclined to vote for Paul, today Emma’s ability to remain faithful even in the face of loss stands out. Plus I feel a need to champion the “lesser known” saint here. I cannot read them without tears. As much as I admire Emma, in this go-round it has to be Paul. Wow! I was all set to go Emma, but reading some of the quotes from Paul made me waver. Nonetheless, Paul’s style of writing has caused me too much anguish and confusion in the pews over which “he” refers to which “him” and are he and him part of “they” and “them” and somehow related to “she” and “her” and at the end of it all does it really all translate to “us” and “we” or is the final meaning actually “those” or can it be boiled down to some phrase of words one syllable or less whose meaning is more clearly defined as “what?” Emma rules! Need a like button, here. Actually laughed out loud at that…thanks! A friend recommended I read Sarah Ruden’s “Paul Among the People”. I haven’t yet, as I am swamped with other Lenten reading, but I was told this book has a realistic picture of the culture in which Paul was writing. For example, the decree for women to wear head coverings, was typically a privilege for the upper-class. Slaves were not allowed to cover up. When Paul said that all women should cover their heads, he was saying that in Christ, we are all the same class. I have lately come to appreciate all that Paul did, and even though he has a bad rap, I will vote for him. Without Paul, we might not have had a church at all. Love the name Emma, but love the writer Paul even more. His quirks and biases and blessed humanity are part of what makes him so infuriating – and engaging. In all my years of reading Paul aloud in church I never really appreciated his writing until recently. I used to complain to my Dad that St Paul had way too much ink! For all his ramblings, Paul had one message. He was indeed a product of his time and culture, but aren’t we all? Paul has undoubtably changed thousands of lives and reached as many hearts by his words and unshakable faith. He has champions in his court. Emma, on the other hand, was a woman of two cultures. She saw a need to save her people, both their health and their souls, despite her personal loss and pain. Although I a “commoner” and not a Queen, I can relate to Emma. I am a Respiratory Therapist and spent my life helping the sick and dying. I am also now a widow and broadening my scope in my early retirement to helping Family Promise’s work with the homeless. Emma wins my heart, because in a small way I understand her journey. Anyone who can continue to live and enlarge her life after the deaths of a child and husband has my attention. My favorite Paul story is from when he was in Athens (I think) and saw all the statues to various gods including one “to an unknown god”. He used that to tell the people about this “unknown god”. The church has long used local culture, brought Christ’s message to it, and incorporated local customs into the Christian story. That makes us become part of the story. Thus we have the beautiful Huron Carol – the nativity story in Huron terms (Hymn # 114 T’was in the moon of wintertime … This is how we have pagan Christmas and Easter customs in our current celebrations. These customs do not detract from our celebrations; they add richness and beauty to them. I love Emma, but voted for Paul. He started the spread of the Gospel to many places and paved the way for so many others. They’re waking up in Hawaii. Wow! it is amazing how close the voting is! Paul spread the message of Jesus and Emma lived it. Once again the Lord uses people, warts and all, in a diversity of time and places to spread His message and do a good work on earth. The great events that cover the face of the earth, or the small acts ones like caring for a dying individual or helping one person in need. Which glows brighter before God? It’s a messy and complicated business, this Christian life. Paul is getting a bad rap. For his time, his attitudes toward women and slavery were much more loving and inclusive than the prevailing thought. Makes as much sense to criticize his writing style as to quibble about “email style.” He was putting out fires and dealing with crises all over the middle east–and often from jail. …and writing in a punctuation-optional language to boot. Mustn’t blame Paul for the rules of koine Greek! Think Paul is bad? Check out “Buffalo buffalo Buffalo buffalo buffalo buffalo Buffalo buffalo.” Paul looks pretty good in comparison, no? Thanks for the link, with graphics no less! BTW: I read all the comments, sometimes before, sometimes after I’ve voted. The comments are either the appetizer or the dessert to this daily meal. i’m not allowed to read Saint Paul at Saint Paul’s – i think i have to take a correspondence course or something – but i wouldn’t have any problem with his use of the language. he writes as if he is speaking, and what do you know, when one reads on Sunday morning, one is speaking. i voted for Paul in the previous round, but Emma’s story won me over today. While my second year of EfM a number of years ago increased my understanding of Paul, he still has a lot to answer for. Emma gets my vote today. I’d be more than happy to live my life and have to have people say I have a lot to answer for like Paul. Paul’s words liberated women like Emma to do the ministry she did! So hard to choose, but I’m voting for the marginalized and heroic underdog, Emma! Heidi Shott’s write-up gives a wonderful picture of Queen Emma. I AM impressed by her eclecticism and her devotion to her people’s welfare. If Hawaii rallies to carry her through to next round, I will be pleased to be living in a world where gratitude, compassionate leadership, and mutual care and affection can carry the day. I too take serious issue with the statement about Paul’s attitude to women in the write-up, as outlined by Dan and others above. In addition to evidence from carefully reading what Paul himself actually wrote, there is credible scholarship that redeems Paul from the charge of misogyny – I wish more of it had been brought to bear by his advocate here (Chris, Dude — it’s Saintly Sixteen! Is this a time to be handing ammo to your opponents? By no means!!). Because of Romans 8:38-39 (amen, dr. primrose!) — and because I too used to persecute Paul for the sins of his later interpreters and so have a lot to make up for — voting for Paul today. I thought it was Paul who said, “Therefore you have no excuse, whoever you are, when you judge others; for in passing judgment on another you condemn yourself, because you, the judge, are doing the very same things.” My bad; it must have been Emma of Hawaii. Oh, I’m enjoying the competition for the most part. I just saw waaaaaaaay too much slander of Paul in the last round. I agree that the anti-Paul comments are revealing, and somewhat sad. Apparently Christopher is missing that people around the world are paticipating in this activity. Or I would be, if I weren’t from around the world. So why did you make your statement? Because we’re a distinct minority! I should perhaps add that ignoring your Bishop is a time-honoured Anglican tradition. Those Hawaiians ought to be right in behind Paul! Speak for yourself — we may not always agree with our bishops, but I don’t think we ignore them!! I love Queen Emaa, but come on….we’re talking St. Paul here! I can’t fathom voting for anyone else in a match against Paul! Some of my favorite verses come from his letters; I even have “faith hope love” tattooed on me, I love Corinthians so much. I think the fact that he gave us most of the New Testament is a testament to the reason he should go all the way to the Golden Halo. I suppose most people root for the underdog, but I am not most people! At Evensong last night, in the Cathedral of Saint Andrew – Honolulu, founded by our Saints, Queen Emma and King Kamehameha IV, I was privileged to read Romans 12, a great and moving example of Paul’s writing but also one that embodies the spirit of our dear Queen Emma. Like Paul, Emma continues to change lives. I vote for Emma. Can’t believe St. Paul is losing to Emma! When you examine what each has done to further Christianity, I just think Emma is outclassed. I respect her contributions to the church in her native islands, and love the beauty they represent to all of us, but without Paul, Christianity to day might not have existed outside the Jewish tradition. Go Paul. It would seem that the good people from the Diocese of Hawaii have once again organized themselves and their votes will move Emma forward. This seems to be causing concern among some folks who apparently do not understand that this is Lent Madness. Reason and serious thought and study will not always prevail in this game. In the last two weeks how many persons have commented that they voted for the “underdog” as if that quality makes one more saintly? How many people voted for a particular saint because they shared a common name or a common date for a significant life event, as if either of these factors makes one more saintly. How many folks voted for Margaret of Scotland because they had a Scottish heritage and were under the mistaken impression that she also had one? The list of things that people cited as reasons for a particular vote that showed little or no theological reasoning or rationale could go on and on. However remember this is Lent Madness and personally I intend to keep playing, having fun and not attaching a lot of serious import to the outcomes. Kudos to the Bishop of the Diocese of Hawaii who seems to have been able to organize his people. I always thought that organizing Episcopalians was a bit like herding cats, Theoretically possible while practically impossible, but apparently it has happened in Hawaii. The SEC might have just found their first candidate for next year’s event. Perchance you are taking this a bit too seriously? No one thinks anything happens to the heavenly status of anyone based on whether or not they win the Golden Halo. Does it make any difference which college team wins the NCAA or NIT tournament? The sun still rises in the east. Water still flows downhill. And, a bunch of people have fun. It’s fun because we have to think about Christian topics, “issues”, history and the meaning of Jesus Christ’s sacrifice. So, LM is not a trivial pursuit for us in the present. Meanwhile, each saint in Heaven still wears a Golden Halo. Cat, is that the tattoo we get of we vote for every match up? Hey, SEC, I am working hard for my tattoo and I want to see it, now! I have been following this match up religiously (pun thoroughly intended) and knew that when the Hawaians woke up things would change in a great big hurry. Although I voted for Paul, it’s great to see a whole diocese get behind the loal girl. The decisions are getting harder. However, there’s no reason to cast aspersions (or, as my sister says, “asparagus”) on people who don’t vote for your favorite. We all have our reasons and all reasons are valid. Don’t spoil the fun by getting super critical of others’ choices. As someone said, “These saints already have crowns, ” and they won’t get bigger ones just because we mere mortals are voting to move them forward towards the Golden Halo. This has turned into a delightful Lenten discipline for me — SERIOUS practice in LIGHTENING UP — reminiscent of the year that, inspired by Luke Johnson’s New Testament lecture on Galatians, I gave up virtue for Lent. May the Madness reign! I hope all you Emmanites 😉 come to her side against Cranmer! As the brackets narrow down, the rationales become more interesting. I keep submitting, but no tote bag! What gives? An extension of Shrove pancakes and Mardi Gras king cake into all of Lent! Madness is delightful! And, I voted for Paul along with Joan! HA! Have Fun!!! Emma, of course. No question. Such a dilemma! LM’s not like in basketball where one chooses one team over another! Voting for one saint over another is just awful ! We’re all on the SAME team! I voted for Emma, though I thought long and hard about it. I’m actually a fan for Paul. I grew up in a Pentecostal tradition, one that began ordaining women before 1920, I might add, a little gay boy. We were in church whenever the doors were open, which was quite often. I learned to understand complex sentences reading Paul and, much more importantly, I learned grace. So, my vote wasn’t anti-Paul. Instead, I voted for Emma because she, as I read her story, lived out the Christian call that Paul describes. I’d vote for both of them if I could, but as much as Paul influenced me, I think he influenced Emma more. If the vote were for “who has had the greater importance in the church”, I’d go for Paul. But that’s not how I’m approaching Lent Madness (nor how I approached it in previous year). I read the biographies, learn something often, and vote for the person whose story most touched me that day. As much as I like Paul, My vote goes to Queen Emma! I’ve done some reading of my own on Emma in hopes of writing a curriculum on her. If my memory serves me right, she was a sore loser and would not socialize with relatives at family gatherings after she lost the election to David Kalakua. I enjoyed reading the above information about her, which gives me inspiration to return to my project. Now I have a more positive viewpoint about her work!! Well, don’t judge her too harshly — a lot of people don’t socialize with relatives or even go to family gatherings for seemingly lesser reasons. GO PAUL! GO PAUL!GO PAUL! It was not a legal election. They overthrew Emma, as the men of the government did not want a sole female leader. She was treated in a cruel and humiliating way. She was the Queen of the people, not the pick by male politicians. Queen Emma was ahead of her time. Voting for our wonderful Queen Emma. She did so much for the people of Hawaii and left such a legacy for generations to come. Her contributions continue to generate hope for the future of our Hawaiian islands and help those in need. For Queen Emma of Hawaii, of course. Needless to say anything. « The People Speak. On Camera.